The intricately sculpted device made by Paul Barclay and his team of physicists is so tiny it can only be seen under a microscope. But their diamond microdisk could lead to huge advances in computing, telecommunications, and other fields. 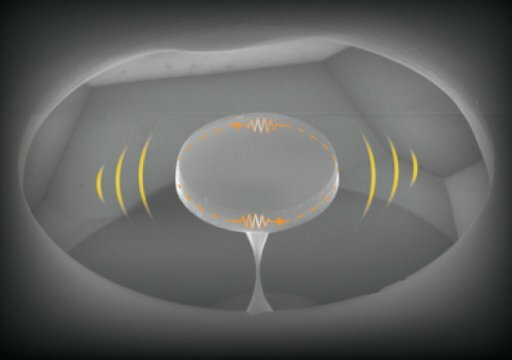 Barclay and his research group — part of the University of Calgary's Institute for Quantum Science and Technology and the National Institute of Nanotechnology — have made the first-ever nano-sized optical resonator (or optical cavity) from a single crystal of diamond that is also a mechanical resonator. The team also measured — in the coupling of light and mechanical motion in the device — the high-frequency, long-lasting mechanical vibrations caused by the energy of light trapped and bouncing inside the diamond microdisk optical cavity. "Diamond optomechanical devices offer a platform to study the quantum behaviour of microscopic objects," says Barclay, associate professor of physics and astronomy and Alberta Innovates Scholar in Quantum Nanotechnology in the Faculty of Science. "These devices also have many potential applications, including state-of-the-art sensing, technology for shifting the colour of light, and quantum information and computing technologies." The team's work is published in the peer-reviewed journal Optic, "Single-Crystal Diamond Low-Dissipation Cavity Optomechanics." Quantum nanophotonics involves developing micro and nanoscale (about 100 times smaller than the width of a human hair) circuits for manipulating light. Instead of microcircuits in which electricity is conducted by wires — found in computers, cell phones and other telecommunication technologies — nanophotonics involves transmitting light through wires. It's like fibre optic technology, but at a much smaller and potentially more complex scale, allowing information to be transmitted more densely and more efficiently. Nanophotonic technology also is a boon to researchers exploring new regimes of quantum physics — the nature of matter and energy on the atomic and subatomic level. "The ability to trap light in nanoscale volumes in an optical cavity creates high electromagnetic intensity from tiny amounts of light, and amplifies light-matter interactions that are typically nearly impossible to study," Barclay says. Barclay's group used diamond to make their microdisk, which looks like a microscopic-sized hockey puck (the optical cavity) supported by a very tiny hourglass-shaped pillar in the centre. The group used light to vibrate the disk to a gigahertz frequency, the frequency used in computers and cell phone transmission. "It shows that diamond has a lot of potential as a material for making mechanical oscillators at this scale," Barclay says. "Imagine taking a tuning fork made of diamond and ringing it. It's going to ring at a very high frequency for a really long time. This also helps us measure these delicate quantum effects." Barclay's PhD students, including Matthew Mitchell and Behzad Khanaliloo, lead authors on the paper, fabricated the microdisk from commercially available synthetic, single-crystal diamond chips. The students also designed and built the system to measure the device's optical and mechanical properties. The group, which included doctoral student David Lake, master's student Tamiko Masuda and postdoctoral scholar J.P. Hadden, used facilities at the National Institute for Nanotechnology (NINT) and the University of Alberta's nanoFAB. "By essentially inventing a new nano-fabrication process for single-crystal diamond, we have demonstrated a device that is pushing the state of the art in cavity optomechanics," Mitchell says. "It holds great promise for realizing an on-chip platform to control the interaction of light, vibrations and electrons." Khanalioo says: "We're excited about using these devices for devising ways to create connections for quantum computers." "Just making the device, within the nanophotonics research community, is an accomplishment," Barclay notes. "I would say we're one of the best groups in the world, thanks to the work of the students, in creating optical probes to get light into and out of these devices." The above post is reprinted from materials provided by University of Calgary. The original item was written by Mark Lowey. Note: Content may be edited for style and length.